I have many pieces id like help to identify as you have been so successful so far- is it OK to keep adding them? Is it better to add several on one post /one group photo? While I await your replies I couldnt resist sending a couple more. 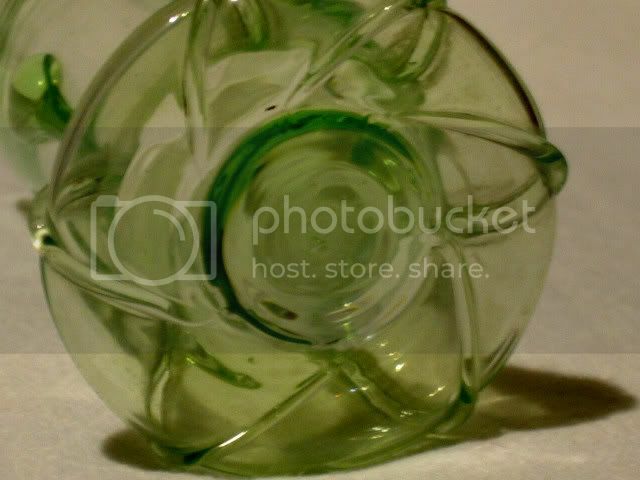 This trailed glass is one of my favourite pieces only 9cm but perfectly formed. I cant show the base too well but it seems to have an S shape impressed in the centre but this could be a feature of the pontil (which is not polished but fairly smooth). 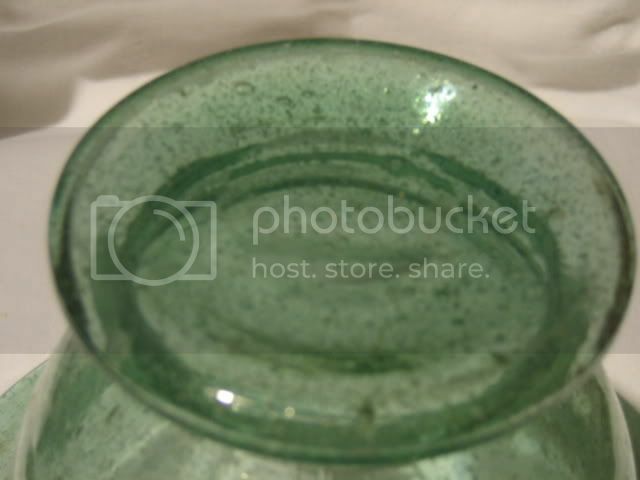 The next is a bubled vase with ground/polished concave pontil. I was thinking the bubbly one was "Dutch" (based on info passed on at "antique fairs" some 15+ years ago). It has a similar look to one that I have but with a transfer applied scene, in black, of two ships - one being the "Santa Maria". I've seen another one - in blue bubbly glass - with a tranfer decoration of an Inn scene. Mine is just under 6 inch height and the foot is very much like David's, with a smoothly ground concave area to the base. I don't recall ever seeing a trailed item like the one shown! Tears (what you produce when you cry, not gaps in bits of paper) were certainly used by Stuart, Walsh and Whitefriars. So if they used them, you can assume that everyone else in Stourbridge could have used them, and, probably, many glassworks in mainland Europe and further afield. Like Kevin, I don't recognise the shape, although that particular shape is unlikely to be modern. Our revered moderator has touching faith in my ability to attribute bubbly glass. This is completely unwarranted, except for the most eclectic Walsh shapes. If you go into the souvenir shops at Roman sites like South Shields and Wallsend Roman forts, you will see wonderful "Walsh Pompeian" on sale, made a few months earlier presumably in a third world country. I deal in the Walsh originals and still can spend a long time making up my mind with unmarked pieces in my hands, with Eric's book, and a magnifying glass, and a UV lamp! It has to look right, feel right, be the right colour, and exactly match the patterns in the book before I will even consider buying or attributing it. It is worth spending some time looking for the acid-etched Walsh mark. I have in stock one marked piece where you can only see the mark out of doors in cloudy light and if you know exactly where to look. It took me about a week to find it. The actual mark on this piece is just a very faint "als"! Walsh Pompeian made for Hill Ouston and sold by them into the antiques trade is generally unmarked with a rough pontil mark, for obvious reasons. 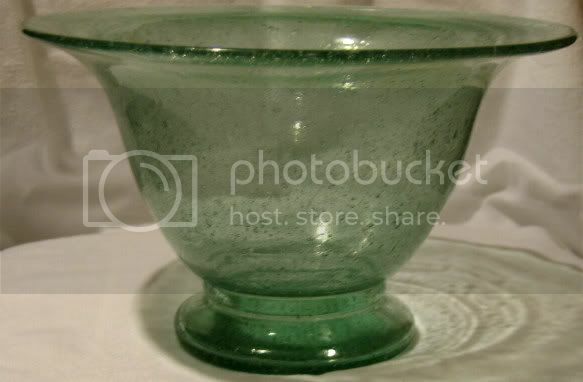 There are at least two other mid-C20 ranges of bubbly coloured clear glass, including the range Kevin mentioned, all of which are as yet unattributed to my knowledge. If you can't find a mark, it is probably best to take it to a glass fair and ask for an opinion. I doubt whether you will find anyone prepared to attribute it over the Internet. Thank you for your replies ive doubled checked for a mark -but nothing to be seen. Bernard- When you said , 'if you know where to look' did you mean the mark may not be on the base? . I see what you mean about the similarity to Walsh- ill have to look out for a similar shape . 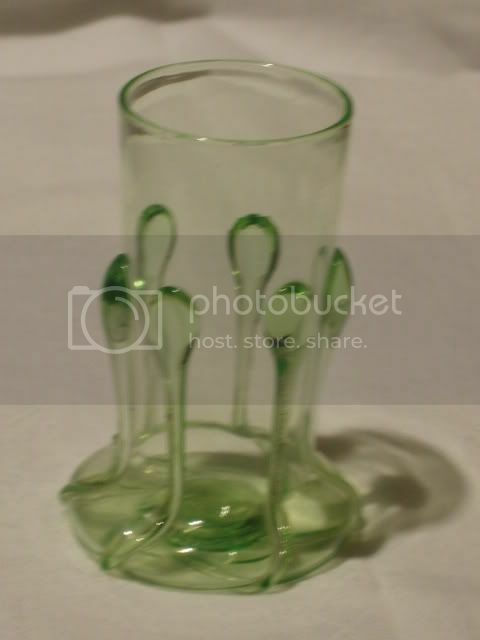 KevH Do you have any ideas where i could find pictures of the dutch glass you mentioned? I thought the glass with the tears may be difficult. I wondered if the base might help it is quite unusual - the tears all form a neat star like pattern under the base. Some expert control needed to do that by hand. Yes, I could easily go along with Ivo's comments. And no, I cannot point to any pictures where these are stated as "Dutch" - it was just dealer comments at fairs. Also, now I think about it, there was an example, again with transfer decoration, in an "well-to-do" provincial uk auction many years ago. Trouble is, I did not get the catalogue of that auction - just strolled around for a viewing and decided not to go for anything. On my difficult piece I have stuck a label with arrows pointing at the "als" â€” and even then most people can't see it! "Bernard, you must be joking" is the usual response, resulting in a trip outside. Walsh acid-etched marks can be very faint indeed. I have never found a Walsh mark anywhere other than on the base (obviously excluding objects without a base). Usually either somewhere on a ground out pontil mark, or close to and parallel with the edge. This second position unfortunately usually coincides with 75 years of wear, another reason why Walsh marks are difficult to find. Keep looking. I am supposed to be an expert and it took me a week or more to find a Walsh mark. If you are not familiar with them it could take you much longer. Page created in 0.598 seconds with 28 queries.